So on the very day that I landed in Ireland, on an overcast, windy afternoon I went up to the high ridge above Lough Tay to see if I could spot any Vikings. 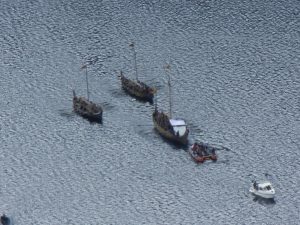 It was already past 4:00 p.m., but far below me I could see three Viking ships on the lake, their oarsmen pulling for the shore. Apparently, the day’s filming of a segment of VIKINGS Season Five was nearly finished. Lough Tay, for all I could tell from my vantage point, might have been a stand-in for the North Sea, the English Channel or the Mediterranean. 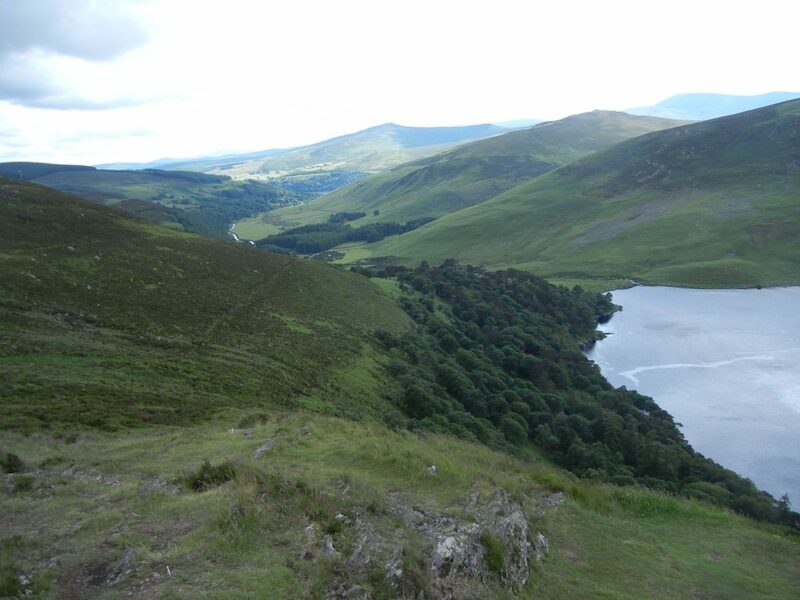 Those pesky Vikings went everywhere, and with the help of CGI, Lough Tay could look like any of those places. To my disappointment, the Viking village that had once graced the lakeshore had been dismantled some time ago and re-built at Ashford Studios, about twelve miles away. Another quite different Viking village had been built on the River Boyne, but that was miles away and, I would discover, off limits to anyone but the cast and crew. Now, as I gazed down upon the scene below, there was little to see except an empty, pristine beach and those ships making for the shore. The next morning I explored that lakeshore, after a somewhat hair-raising drive down the long, steep, narrow lane leading to it. 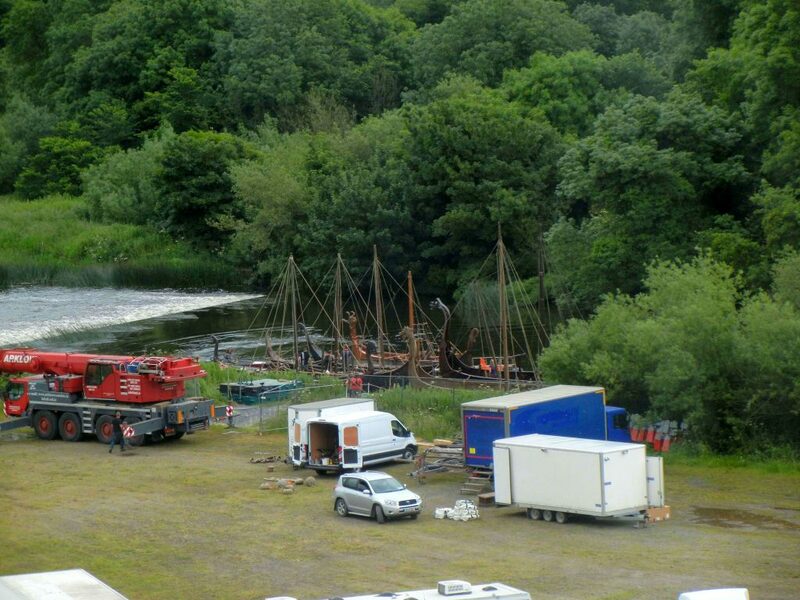 The ships, the cast and most of the crew were already on their way to their next filming location on the leafy banks of the River Boyne at Slane. But a few members of the crew – the team responsible for those Viking ships that I’d seen on the lake the previous afternoon – were preparing the last pieces of equipment for transport to the new location, and they very generously took time out of their busy day to speak with me. Lough Tay, they told me, is an ideal spot for filming VIKINGS. 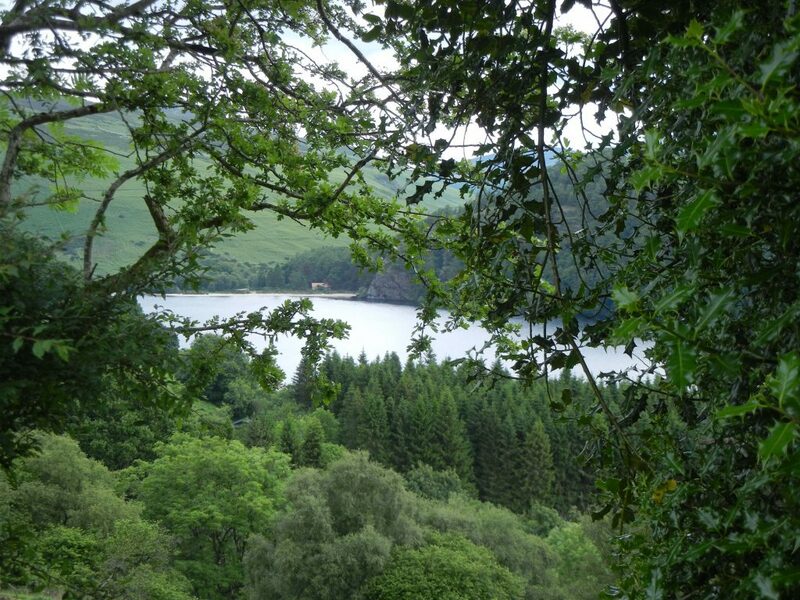 The lake is on the private Guinness Estate, and what meets the eye as one gazes around is exactly what would have been seen here a thousand years ago. There are no buildings, no telephone poles, nothing to intrude on the stark beauty of nature, yet it is easily accessible (despite that steep, narrow lane) for the cast and crew. 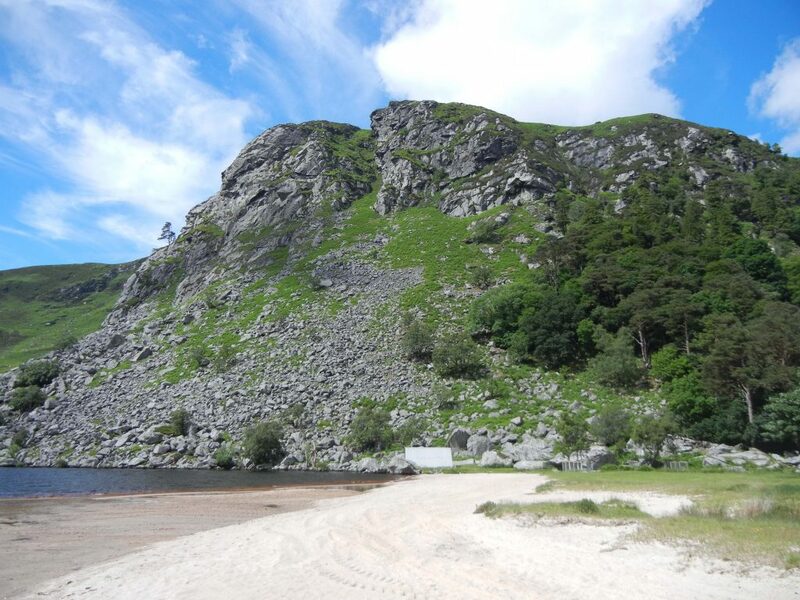 A lot of credit goes to the Production, Art and Set Design teams for transforming the cliffs, forest and meadows around Lough Tay into Norway, England, France or Iceland, as needed. 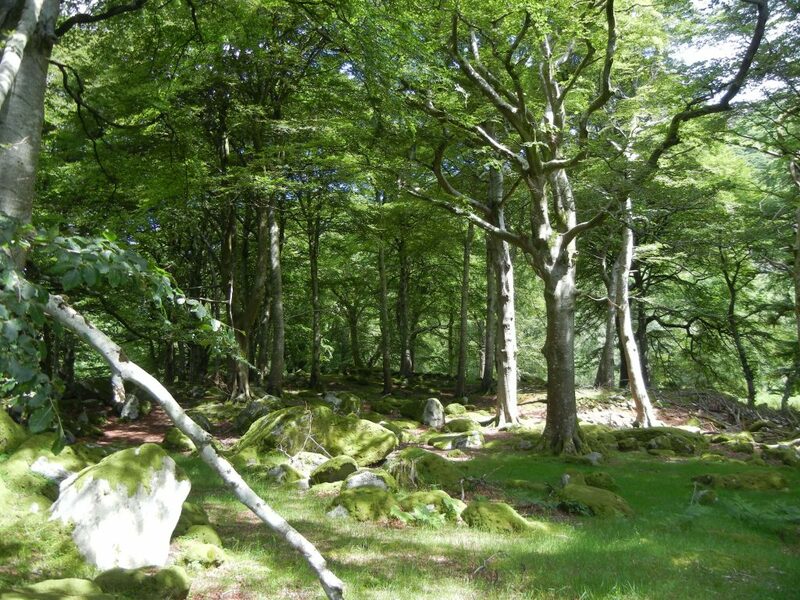 This is not the only location in Ireland that the series has used, of course. There are other lakes, including nearby Lough Dan. There are rivers too and, in particular, there is a quarry that played a very important role in an episode that aired earlier this year. In Episode 8, Portage, a quarry was the stand-in for the River Seine outside of Paris; the ships were actually hauled up the quarry’s sides; and it was, in fact, the cast that we saw hauling on ropes attached to pulleys from which hung those very heavy Viking ships. Because I’ve done some research on Viking drekars myself, I was interested in the ships used for this series. The show’s fleet, they told me, was built by a company in the Czech Republic near Prague, and as I listened it seemed to me that the ships themselves are as much characters in the show as the actors who sail in them. Just as actors have costume changes, the ships’ hulls are re-painted, and their sails and figureheads changed to give them a different appearance from episode to episode and season to season. Later on, at the River Boyne, I would see crew members carrying figureheads along the temporary wharf that had been installed for the fleet. I would reflect that a millennium ago the Vikings would have done the same thing, because the beast heads that struck terror into the hearts of the Franks and the Anglo-Saxons would have been removed when dragonships sailed into friendly harbors. The VIKINGS team put a great deal of research into the design of their ships to make them as historically accurate as possible although, as you might imagine, there had to be some changes. 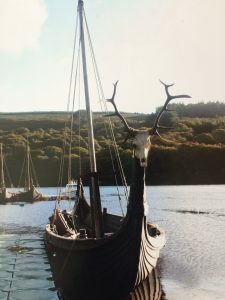 The three smaller ships, referred to as ‘the workhorses’ are fibreglass designed and painted to look like the clinker-built ships of the vikings. The two larger ships are made of plywood rather than oak because otherwise they would be too costly and way too heavy. These larger ships – one of them new and never yet seen on the show (watch for it in Season Five) – were given an extra strake and so a higher freeboard, for reasons of safety. We wouldn’t want Floki or Ragnar toppling into the water by mistake, right? Later that day at Slane I caught a glimpse of the new ship and some new figureheads and sails that have been designed for the rest of the fleet. I noticed that there were coffers rather than rowing benches at each oarlock – a testament to the production’s emphasis on historical accuracy: Ninth century vikings sat on similar wooden boxes that held their belongings, with maybe enough empty space left inside so they could top them up with a little Anglo-Saxon loot. I am enchanted by good story telling, and this series has plenty of it. A sneak peak behind the scenes to get a better understanding of how the magic is done has only added to my admiration. 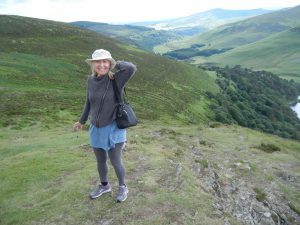 Although I never managed to run into Ragnar, Lagertha, Floki or Rollo, I spent a beautiful day at Lough Tay and later at Slane. My thanks to Alistair, Stephen and Tom for sharing their time and their knowledge. Special thanks to Marilyn & Seamus Kinlan for their warm Irish hospitality at Wicklow Way Lodge. This entry was posted in Vikings and tagged Anglo-Saxons, dragon ships, Floki, King Alfred, Lagertha, Lough Tay, Ragnar, Rollo, Set Design, TV Series, Vikings. Bookmark the permalink. Love following your posts! …and your books! Hi Sharon. Thank you for saying hello. It’s great to know that someone reads my posts! What an interesting post. Thank you for letting me live vicariously through you. You are most welcome, Susan. I am very lucky to be able to go to all the places I get to. Have to credit my husband for being the man behind the driver’s wheel in the British Isles. How awesome would it have been to meet that wonderful cast and crew? Thanks for posting these wonderful pics! As a fan of Vikings, it was fun trying to place the locations in your photos with the scenes in the show! Hi Jenny. Yes, it would have been wonderful to meet the cast. I think the people who are attending Comicon down in San Diego are getting just that chance. The few members of the crew that I met were awfully nice. I’ll certainly be watching the upcoming episodes with my own memories of Lough Tay in my mind!